IQ Stream Technologies is one of the top quality SAP FICO training institutes in Bangalore with highly experienced and skilled professional trainers delivering the courses. SAP stands for Systems, Applications, and Products in Data Processing. 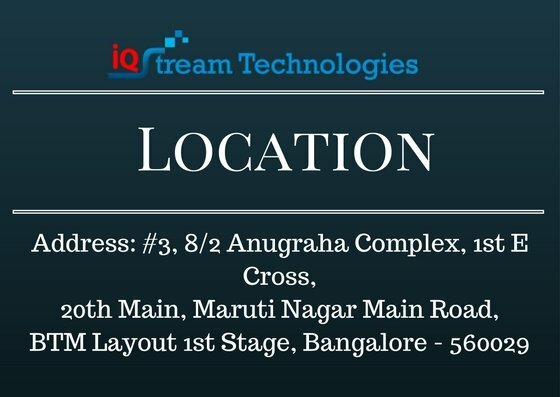 IQ Stream Technologies in Bangalore also offers placement assistance for students who enrolled in SAP FICO (high-performance analytic appliance) Courses. SAP Finance and Controlling (FICO) is a SAP module that is widely used. SAP FICO module includes SAP FI configuration, SAP FI user and SAP CO user, SAP CO configuration. We offer advanced SAP FICO training classes, advanced learning experiences and tools for better learning, understanding and experience. Our FICO course content and syllabus are very advanced and updated and curated by highly experienced trainers. What is the SAP FICO? SAP FI CO - the best configuration for internal as well as external accounting processes; represents FI (Financial Accounting) plus CO (Controlling). Primary responsibilities of a consultant: Experience in SAP FI and CO modules (usually at least 2 - 5 years) - General Ledger (GL), Accounts Payable (AP), Accounts Receivable (AR), Cost and Profit Center Accounting (CPA) and Internal Orders. Which SAP module is most in demand? SAP PI or SAP Process Integration. What is Fi in SAP? SAP Financial Accounting (FI) SAP FI module as the term suggests deals in managing financial transactions within enterprises. What is the use of SAP FICO? What is the meaning of SAP FICO? SAP Finance and Controlling (FICO) is one of the most widely used SAP modules. SAP FICO module includes SAP FI configuration, SAP CO configuration, SAP FI user and SAP CO user. What is the use of BW in SAP? SAP BW is a comprehensive business intelligence product centered around a data warehouse and optimized for SAP's R/3 environment. What is a COPA in SAP? Profitability Analysis (CO-PA) enables you to evaluate market segments, which can be classified according to products, customers, orders or any combination of these. What are the modules in SAP? SAP FICO stands for SAP Financials (FI) and Controlling (CO). They both are related to accounting and hence always learned together. SAP FICO helps enterprises in managing financial transactions. Application of SAP ERP in an organization enables the employees to manage the accounting and business transactions in unified manner. Financial reports are crucial for any management to understand the current situations of the enterprise and plan future. SAP helps the management by providing various kinds of reports based on the data collected during financial transactions managed through SAP FICO module. SPA FICO is the most matured accounting software available in the market. There are thousands of enterprises and IT consultants use SAP FICO. This course is very much suitable for the students coming from commerce and finance background like B.Com, MBA Finance, M.Com etc. Most of those students are not much exposed to ERP software and hence they land in low paying jobs. Either you are a freshers with such background or already working in a company with such background learning SAP ERP (FICO) will help you in making better career and sustain in the market with good job security. SAP FICO course at IQ Stream Technologies it taught by industry experts and high focus is given for understanding the concepts along with extensive practices.